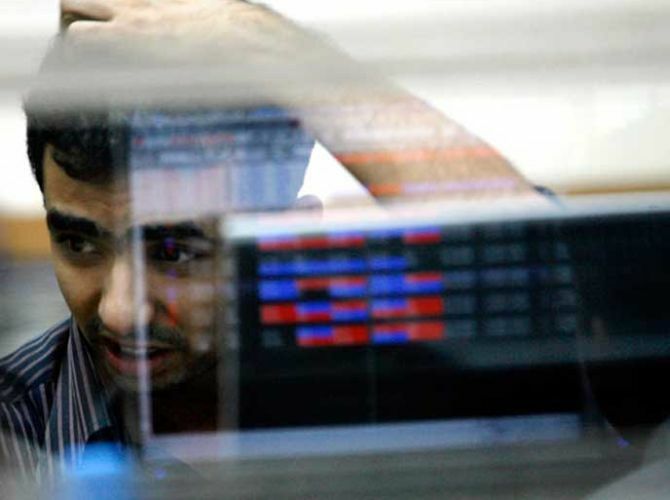 Stocks reeled under huge losses on Thursday as the benchmark Sensex plunged sharply by over 465 points, the biggest single-day fall in three months, after India carried out “surgical strikes” on Wednesday night on terror launch pads across the Line of Control. The rupee too was in the line of fire, down 49 paise (intra-day) against the US dollar, to trade at 66.95. World markets, however, cheered the surprise deal cut by OPEC to slash oil output for the first time in eight years. The stocks started off higher extending Wednesday's recovery, but suffered a jolt after announcement that India conducted surgical strikes last night on terror pads across the LoC. The Sensex hit a high of 28,475.57, in sync with a firm Asian trend after a surprise decision by OPEC to cut oil output to push up prices. But the Army’s announcement triggered all-round selling, sending the Sensex into a tizzy, which broke below the key 28,000-mark. It settled at 27,827.53, down 465.28 points, or 1.64 per cent -- its biggest single-day fall since June 24 and weakest closing since August 26 when it closed at 27,782.25. The gauge had recovered 69.11 points in Wednesday’s trade. The 50-share NSE Nifty, which cracked below the 8,600-level to hit a low of 8,558.25 during the session, managed to recover part of the initial losses and settled down 153.90 points, or 1.76 per cent, at 8,591.25. The mood turned cautious after the Army said the surgical offensive on Wednesday night came on “very specific and credible information” about Pakistan-based terrorists being pushed into Indian territory for carrying out strikes in Jammu and Kashmir and various cities in India. The expiry of the September series contracts in the derivatives segment influenced the trading sentiment, brokers said. The red mark was near complete as 29 of 30 Sensex stocks slumped. Adani Ports, Sun Pharma, ICICI Bank, GAIL, Tata Steel, Lupin, Tata Motors and SBI crashed by up to 5.01 per cent. TCS managed to close in the green, up 0.46 per cent. Among the BSE sectoral indices, realty suffered the most, by 6.31 per cent, followed by power (4.11 per cent), healthcare (3.26 per cent), metal (3.17 per cent), infrastructure (3.15 per cent), consumer durables (2.84 per cent), PSU (2.82 per cent) and capital goods (2.50 per cent). Broader markets also performed weak, with the BSE small-cap index falling 4.02 per cent and mid-cap 3.60 per cent.